You might want to sit down for this one. I would... because this combo is mind-blowing! 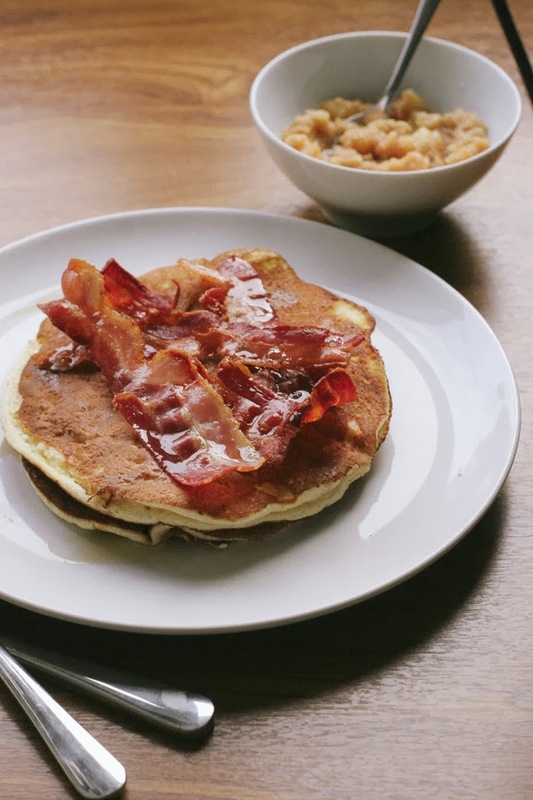 This most scrumptious breakfast/brunch delight includes fluffy American pancakes, bacon aaaaand salted caramel apple compote. Are you in heaven yet? The good news is that you'll have plenty of salted caramel left over to have with ice cream or drizzle over cupcakes as well as more than enough apple compote to have with your breakfast porridge or yoghurt. We are essentially making three recipes here and just throwing them together into one heavenly combination. Beware this is a hefty old breakfast and will probably last you all day! First make your apple compote. Place the diced apples in a heavy bottom saucepan over a medium to high heat, add a dash of water and cover with a lid. Leave to simmer for about 10 minutes stirring occasionally. Add the salted caramel sauce and give it all a good stir. Continue cooking for a further 10-15 minutes or until the apples have completely disintegrated and you are left with a lovely smooth compote. 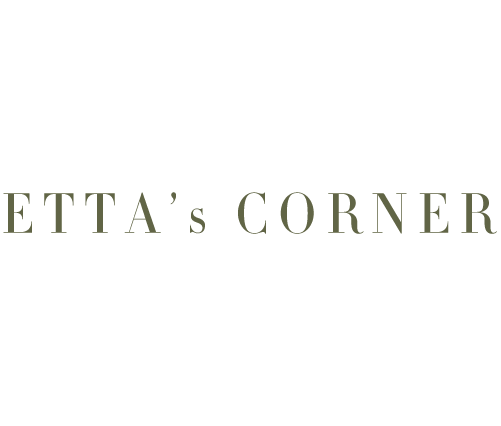 If you wish to store the apple compote for a little while, place it into a sterilised jar and close the lid. (this is how you sterilise jars). 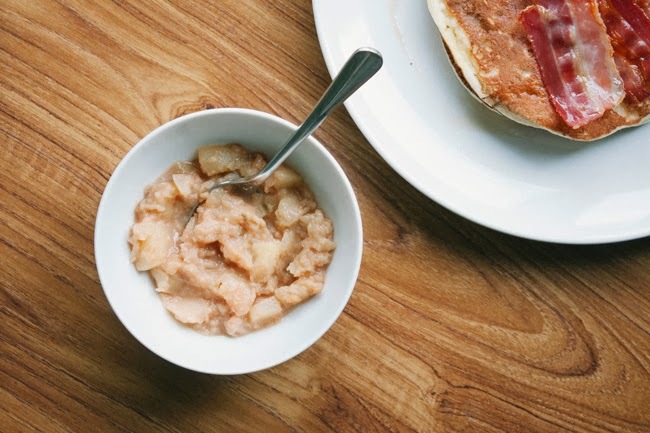 If you are planning to use the apple sauce fairly quickly you can just keep it in a tupperware in the fridge. Now to the pancakes. Separate the eggs, placing the egg yolks in one bowl and the whites into another. Add a pinch of salt to the egg whites and whisk (by hand or using an electric mixer) until they form stiff peaks. Set aside. Beat the egg yolks with the sugar, baking powder, flour and milk until you have a smooth batter. Now fold the egg whites into the egg yolk mix. Turn on the grill and leave to heat up. Lay your bacon onto a baking tray and once hot grill until the bacon is lovely and crisp. Make sure you flip the bacon half way through. This'll take about 10-15 minutes but depends on the power of your grill. Heat a non stick pan over a medium heat (I usually add a tiny bit of coconut oil, or any neutral oil, but you can just use the magic of non stick). 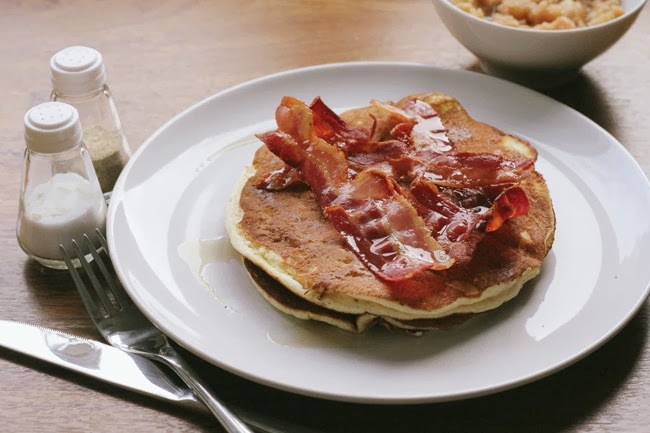 Pour a ladle-full of your batter into the hot pan, spread out with the back of your ladle and cook your pancake for a couple of minutes on each side until golden brown. I did large pancakes, so we ended up with 2 each but feel free to make smaller pancakes if you prefer. Continue cooking until all your batter is gone. Now we get to assembly point. 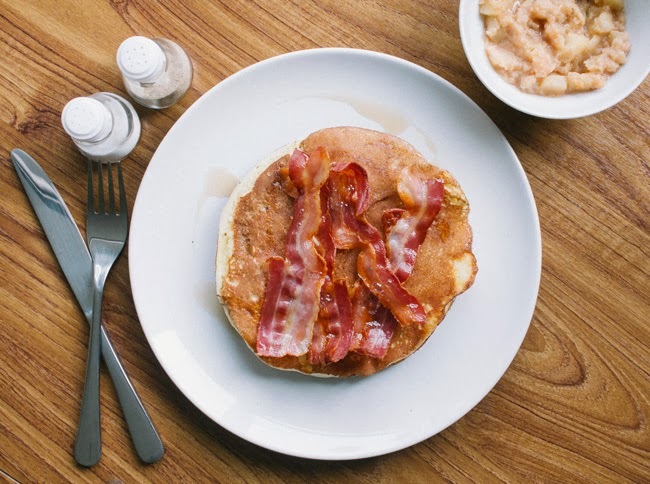 Place a pancake onto a plate top with a dollop of your apple sauce then the bacon and drizzle with a little maple syrup (ooooor if you want to go wild add a little of your salted caramel sauce... I dare you!). 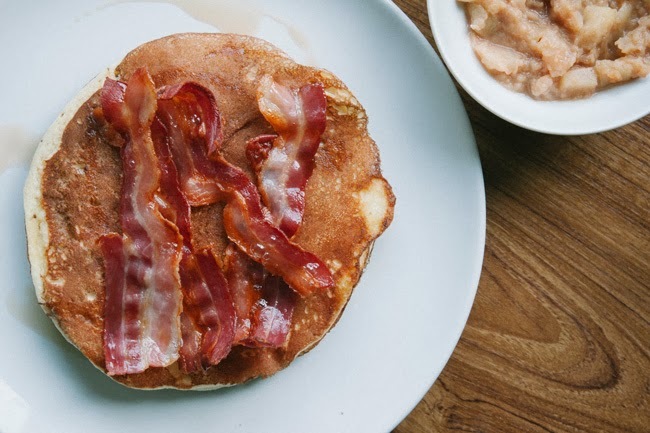 Top this with another pancake and repeat the bacon apple compote procedure. Thank you :) - Haha yes... I realised I look nothing like the fake-glasses-wearing blonde from six years ago anymore and had to face facts and put up a more accurate likeness of myself.